Sixteenth-century sources contain many refer­ences to Anabaptism in Italy, and later observers, among them Karl Benrath, have assumed an organic connection between Swiss or German Täufer and Italian congregations. Critical study of the ex­tant evidence, however, fails to reveal such a rela­tionship. Italy provides, therefore, a classic example of the misunderstandings that may result when loosely defined terms like "Anabaptism" are used freely for polemical purposes. Lutheran ideas penetrated Italy in the 1520s, lead­ing Cardinal Caraffa, the later Pope Paul IV (in office 1555-1559), to publish an edict against Protes­tants in 1530. By 1542 the Evangelical movement had grown to such proportions that Pope Paul III (1534-1549) reorganized the Roman Inquisition, which quickly took steps to liquidate heresy. Many Italians then fled to the Swiss cities, to the back-country re­gions of Graubünden (Grisons), and to some territories now in northern Italy (viz., tile Valtelline and the counties of Chiavenna and Bormio) which were at that time in political dependency upon the three Raetian Leagues. The free-thinking ideas of some of the refugees, reflecting a rationalistic ap­proach to the fundamentals of Christianity, drew the attention of Swiss reformed leaders to them. Camillo Renato of Sicily was the most troublesome of these Italians. He was active in Chiavenna in 1546 and succeeding years and became embroiled in con­troversy over the sacraments and other subjects with the Reformed pastor Mainardi. The struggle dragged on for several years and during its course Renato was condemned by synods and by Bullinger himself. Mainardi called Renato an "Anabaptist" and listed his heresies: he rejected infant baptism and held unorthodox opinions concerning the na­ture of Christ, salvation, the existence of hell, and the sleep of souls. Another man, Tiziano by name and a friend of Renato, professing to be guided only by the Spirit, combined anti-Trinitarian views with rejection of infant baptism. Although he opposed the magistral use of the sword by Christians, neither he nor Renato was associated with any northern Täufer community. Both Renato and Tiziano are best thought of as "spiritual reformers." There are scattered references to later Italian "Anabaptist" ac­tivities in these border regions, but they are careless polemical accusations. In northern Italy around 1550 there flourished an evangelical movement, often called "Anabaptist," whose radical teachings closely resemble those found in the Leagues. Tiziano, expelled from the Leagues in 1549, returned to Italy, and in Florence met one Pietro Manelfi, a former priest. He converted Manelfi and others to that brand of spiritual religion which he had himself learned from Renato. Manelfi believed Tiziano responsible for the Italian "Ana­baptist" movement, and thought he had some link with the northern Täufer. Internal evidence belies the latter connection; and the origin of the move­ment can hardly be ascribed to Tiziano, for the anti-Trinitarian teachings of Servetus had been prepar­ing the soil in Italy at least since 1539. But Tiziano certainly played a leading part in the growth of a number of small clandestine communities which existed in Venetia by 1550. In that year Christological disputes disturbed the congregation at Vicenza. Manelfi, who defected in 1551 and exposed details of the movement to the Inquisition, described a synod which met at Venice in September 1550 to consider these matters. Although the assembly con­tained delegations from congregations in Switzer­land as well as Italy itself, all of the participants were Italian, the implication being that there was no connection with northern Anabaptists. This synod agreed upon a set of anti-Trinitarian prin­ciples. It seems indubitable that Renato and Tiziano, representing the indirect influence of Servetus, were responsible in large measure for this radical orienta­tion. However, some members of the sect refused to go along with the majority, notably the congrega­tions of Cittadella and Verona. This moderate ele­ment, whose origin and teachings are obscure, seems to have had an independent origin despite similari­ties to the Täufer in their conception of baptism. Following the synod Manelfi and Tiziano worked for a year as missionaries, but then late in 1551 Manelfi exposed the whole situation to the Inquisi­tion at Bologna. In the flurry of prosecutions that followed, some individuals named by Manelfi ab­jured and their depositions confirm the anti-Trini­tarian character of the movement. Others remained true to their faith and fled their homeland. Among these fugitives are to be found not only representa­tives of the anti-Trinitarian viewpoint who consti­tuted a majority of those fleeing to Moravia and Poland but also the only Italians about whom we have evidence of association with genuine Täufer; for several of them eventually found their way to the Moravian Hutterite communities. When these men learned of the Hutterites they were greatly sur­prised and pleased: this is convincing evidence that the Italian sect had developed independently, at least of the Hutterites. One of these men, Antonio Rizzetto, went first to Thessalonica and only after several years joined the Hutterites. Giulio Gherlandi and Francesco della Sega (or Saga,) evidently stayed in hiding in Italy for several years before making the trip to Moravia and joining the Hutterites. These three men stand out because they later undertook missionary trips to Italy for the Hutterites and were there arrested and put to death by the Inquisition at Venice in the 1560s. The net result of Inquisitorial activity in this whole period was the liquidation of the Evangelical move­ment in north Italy. Venetian anti-Trinitarianism had connections with a similar movement in Naples. A deposition made to the Venetian Inquisition by Lorenzo Tizzano, who may be identical with Tiziano, classified hereti­cal opinions in Neapolitan circles into "Lutheran," "Anabaptist," and "diabolical," but this testimony reveals that Tizzano meant "anti-Trinitarian" when he said "Anabaptist." There is no evidence connect­ing the movement in Naples with the Täufer. The evidence given in this article invalidates much of the material in the following Mennonitisches Lexikon articles: Ferrara, ltalien, Manelfi, Mantua, Negri, Padua. Camillo Renato, Pietro Manelfi, and Pranciscus Negri can no longer be considered as Anabaptists, and the meeting at Venice in 1550 was not an "Anabaptist Synod." Amabile, L. Il Santo Officio della Inquisizione in Napoli. Citta di Castello, 1892: I.
Benrath, K. Geschichte der Reformation in Venedig. Halle, 1887. Benrath, K. "Wiedertäufer im Venetianischen um die Mitte des 16. Jahrhunderts." Theologische Studien und Kritiken 58 (1885): 9-67. Bullingers Korrespondenz mit den Graubündnern, ed. T. Schiess, XXIII-XXV of Quellen zur Schweizer Geschichte. Basel, 1904-1906. Cantimori, D. Eretici italiani del cinquecento. Florence, 1939. Church, F. C. The Italian Reformers, 1534-1564. New York, 1932. Comba, E. I nostri prolestanti, Florence, 1897: II. Comba, E. "Un sinodo anabattista a Venezia anno 1550." Rivista cristiana 13 (1885): 21-24, 83-87. DeWind, H. A. " 'Anabaptism' and Italy." Church History 21 (1952): 20-38. DeWind, H. A. "Italian Hut­terite Martyrs." Mennonite Quarterly Review 27 (1954): 163-185. Dolbert, Peter. "Die Reformation in den italienischen Talschaften Grau-bündens nach dem Briefwechsel Bullingers." Dissertation, Univ. of Zürich, 1948. Hege, Christian and Christian Neff. Mennonitisches Lexikon, 4 vols. Frankfurt & Weierhof: Hege; Karlsruhe; Schneider, 1913-1967: v. II, 438 f.
Renato, C. "Trattato sul battesimo e sulla eucaristia di Camillo Renato," in Per la storia degli eretici italiani del secolo XVI in Europe, ed. D. Cantimori and E, Feist, No. 7 of Reale Academia d'ltalia (1937): 47-54. Trechsel, F. Die protestantischen Antitrinitarier vor Faustus Socin, Book II, Lelio Sozzini und die Antitrinitarier seiner Zeit. Hei­delberg, 1844. Wilbur, E. M. A History of Unitarianism: Socinianism and its Antecedents. Cambridge, Mass., 1947. DeWind, Henry A. "Italy." Global Anabaptist Mennonite Encyclopedia Online. February 2011. Web. 22 Apr 2019. http://gameo.org/index.php?title=Italy&oldid=146507. DeWind, Henry A. (February 2011). Italy. Global Anabaptist Mennonite Encyclopedia Online. 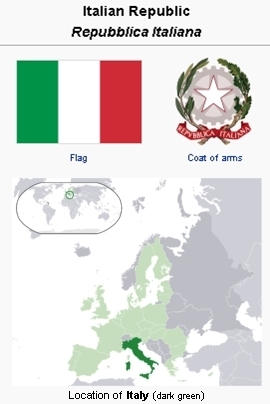 Retrieved 22 April 2019, from http://gameo.org/index.php?title=Italy&oldid=146507. Adapted by permission of Herald Press, Harrisonburg, Virginia, from Mennonite Encyclopedia, Vol. 3, pp. 55-56; vol. 4, pp. 1145-1146. All rights reserved.